The first steps of your child are truly special, aren't they? However, learning to can take time and practice. If you can't wait for your little baby to take those first strides, baby walkers can help you give him/her that extra push. Baby walkers can help your child get an experience of being mobile before he/she can start walking. Walkers are not only fun and entertaining, but they can also motivate your baby to explore the surroundings. With a good baby walker, your baby will feel safe and protected so that he/she can boldly take the first steps with confidence! However, if you have a carpeted floor, you must be careful in choosing the right baby walker for your baby. As the wheels of many walkers are not designed to be used on a carpeted floor, your child might struggle to use them on a carpeted floor. Not only that, but there is a genuine safety concern as well. If the wheels of the walker get stuck in the carpet fibers, the baby can tip over and fall. Furthermore, these walkers can wreak havoc on your carpeted floors as well. They can severely damage and ruin your plush carpet, especially, if you have the one with longer fibers. Although many manufacturers do claim that their walkers work on carpeted floors as well, such claims are often exaggerated. Trust me; I have bought baby walkers that claimed to be ideal for carpeted floor only to realize how misleading such claims were. I know how difficult it can be to pick out a walker that actually is worth it. Finding the best baby walker can, however, be a total nightmare. The hundreds of makes and models on the market only add to the frustration. And if you don't know what to look for in a baby walker, things can get even more confusing. In this detailed baby walker review, we will look at the features that the best baby walker must have and also take an in-depth look at some of the best walkers on the market. 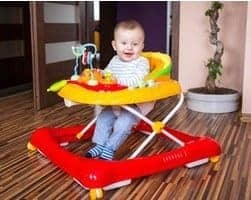 What to look for in a baby walker? The Combi All in One Baby Walker is one of the most value-packed walkers on the market. It features the classic car design that we love and adore. The Walker also doubles up like a bouncing toy. 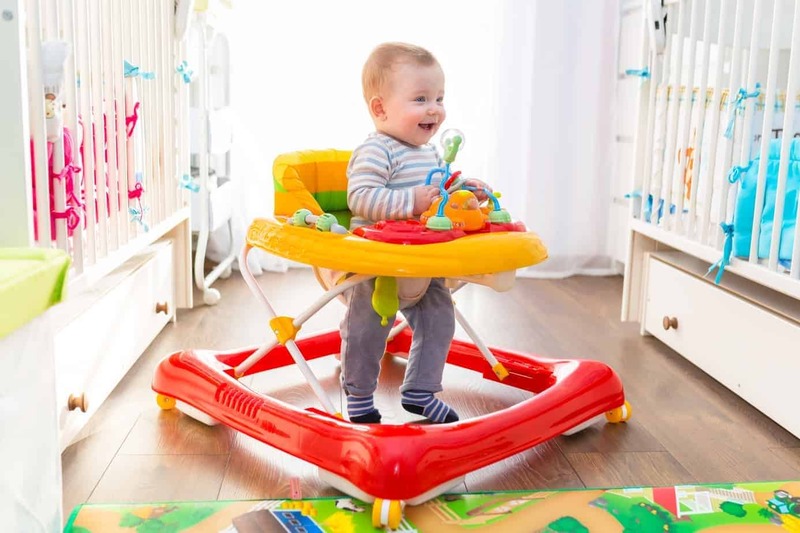 The wheels of the walker can be locked in place so that your baby can enjoy bouncing around in the walker as well. The entertainment console is perhaps one of the best features of this walker. It features mirrors, sounds as well as lights that will keep your baby entertained for hours. There is also plenty of room for holding food tray and snacks on the walker. The seating pad is made from a thick foam material that is soft and yet firm. The fabric cover can be removed for easy cleaning. The Walker weighs 14 pounds which are not as light as some of the other walkers on the list. However, it is a great overall unit that is built with quality materials. The Walker does not fold as small as some of the others on this list. It weighs a few pounds more as well. So, if you are looking for a walker that is very portable, you might want to consider some others on this list. If you are on a budget and still don't want to compromise on quality, comfort, and value, the Safety 1st Sounds Walker is just for you. It is a great budget friendly walker that packs in the feature of some of the top of the line walkers in a highly affordable price range. The entertainment console is one of the main attractions of this walker, and it combines light and sound. There is also a perfect place to keep your little one's snack or a tray as well below the console. The seat fabric is removable and machine washable which is a great feature to have as well. The padded seat is very comfortable, and your baby will enjoy sitting on it without a doubt. When it comes to safety, this Walker does a great job. There are safety features on the walker including an anti-skid wheel system. Although the wheels are smaller than some other walkers, slightly older infants will have no issues with them at all. The walker folds up neatly as well. Weighing in at just 9.8 pounds, it is one of the lightest walkers on this list. To sum it up, it is a great walker to buy if you don't want to shell out big bucks! The wheels on the walker are on the smaller size. If your baby is young, he/she may have a problem to use this walker in the beginning. But with some practice, the problem can be solved quickly. It is hands down, one of the most stylish walkers on this list. It features a design that we have come to associate with Ferrari. The best thing about this walker is the fact that as it is developed by Ferrari, you can see the immaculate attention to detail. Even the wheels on the side of the car spin when your baby cruises in this bad boy! Apart from the gorgeous design, the walker features some of the best features on the market. The entertainment console is one of the best that blows the competition away. It features a steering wheel, sound, light, a working horn and even a vibrating feature that encourages your young one to walk. While packing this walker with so much awesomeness, Ferrari did not forget about the safety either. It has some of the best quality wheels on the market and also features quality anti-skid system. The seat and padding are designed ergonomically to give the most comfort possible for your baby. Also, the seat fabric is stain resistant and machine washable. The walker folds flat and weighs 13.8 pounds which make it quite portable as well. Although the Walker is flawless in design and choice of material, it is a bit pricey. However, considering the value, it gives you and your baby, the higher price tag is quite justifiable. The KidsEmbrave Batman Walker puts your baby in a Batmobile, quite literally! It is a toy every superhero fan needs. Although KidsEmbrace is a newer company, it is gaining a lot of praise for its innovative designs and overall quality. The entertainment console is great and features sounds, lights and even a key that makes an engine revving sound when turned! It is arguably one of our favorite entertainment consoles on any walker that we have tested. The Walker has three height adjustments as well. It folds completely flat and weighs about 13.6 pounds which make it quite portable as well. The walker also features standard safety features including anti-skid pads and durable wheels. We have no problems recommending this walker whatsoever! It is one of the best walkers on the market and is as close to being perfect as any walker can get. It has almost no flaws when it comes to design, durability or choice of material. However, the price may be a bit steep for some people. It is a great looking walker. The car design looks adorable, and the Walker has tons of features as well. Delta Children is a well-known brand when it comes to children toys and accessories, and the Lil' Drive Walker lives up to the expectations. The Walker has one of the better entertainment consoles and toys that the baby can play with while cruising on it. 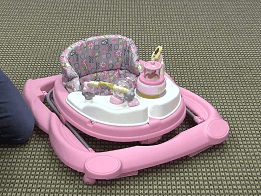 The walker is designed to appear as if your baby is driving a car and it is adorable. The entertainment system is completely removable, and you can clean it with disinfectant wipes. Another great feature of this system is the fact that the seat is completely removable. The fabric used in the seat cover is designed to be wiped clean and resists stains. Three height adjustments allow your baby to keep using this walker for a long time. Storing the Delta Walker is no problem either. The whole system folds up neatly and can be carried around wherever you go. The weight of the unit is less than 10 pounds which are perfect for portability. The wheels on this walker can be a bit stiff. However, it is not a big deal breaker. 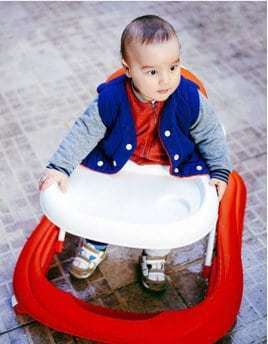 The Bright Starts Walk-A-Bout Walker is made with premium plastic material that will withstand daily use quite quickly. The walker is designed with carpeted floors in mind and works like a charm on even the thickest of carpets that you may have.The wheels of the walker are big enough to allow easy maneuvering of the walker by the baby. Another great thing about the wheels of this walker is the fact that they have a rubberized material on the outside that will protect your precious carpet from getting tugged on and damaged. There is a wide selection of toys on this walker as well. There is a removable electronic toy that produces some beautiful lights and plays some tunes that your baby will love. I also like the fact that the electronic toy can be taken out from the walker so that your baby can use it while he/she is not using the walker as well. Another thing that works in favor of this walker is just how comfortable it is for the baby. The adjustable seat is adequately padded and also has a back support for extra stability. There are three adjustments for the seat so that your baby can use this walker as he/she grows as well. As a bonus, the walker comes in four colors/themes- Roaming Safari, Juneberry Delight, Kaleidoscope Safari, and Green. My son loved this walker when he was little and still using these walkers, and I have no reservations in recommending it whatsoever! As the entertainment system is electronic, this walker will require batteries. It is one of the prettiest baby walkers out there. I mean who doesn't love Minnie mouse, right? The first thing that strikes you about this walker is the color. If you love the color pink, you will love this thing. The color just pops, and the whole thing looks incredibly adorable.However, what makes this walker a compelling buy is the fact that it is as well built as it is pretty. The plastic material used in the walker will withstand almost anything your little one will throw at it. The plastic is completely BPA and Phthalate-free and hence is very safe for the baby as well. The frame of the walker is designed so that there are no sharp edges or corners. The wheels are also placed under a hood to avoid accidents. Speaking of the wheels, they are set on a wider base to provide the most support for the baby. They are also quite large which makes them easy to maneuver on carpeted floor. 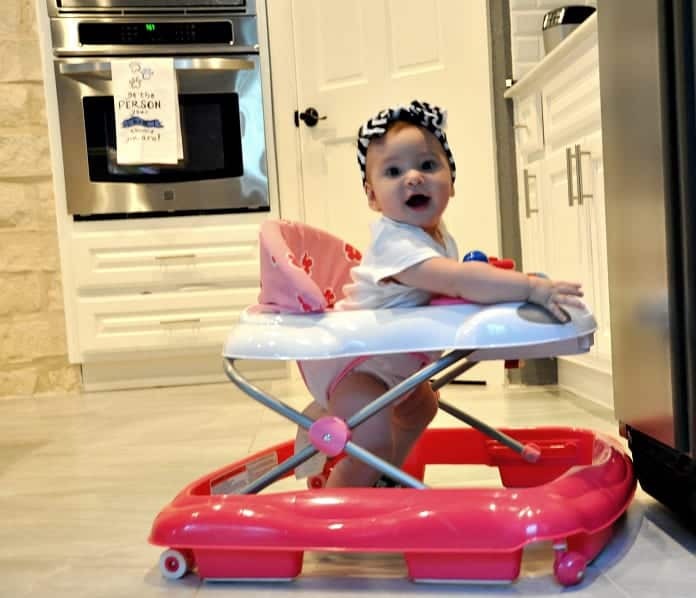 A great baby walker will be incomplete without a decent entertainment unit, and the Minnie Walker certainly does not disappoint in this aspect as well. The toys are arranged so that your baby can play with them, and if you want, you can take them out as well. Once the toys are removed, the walker has enough space for a snack tray for some mobile snacking! The walker is very comfortable for the baby as well. The seat is padded nicely and is also adjustable. There is also some back support for the baby on the seat, which is a welcome design initiative. Overall, this is a fantastic walker that is elegant, comfortable, and most importantly, works great on carpeted floors. Although there are no major cons with this walker, the fact that it is pink may put off some parents, especially if they have a boy. The Joovy Soppn Walker has to be one of the most elegant and minimalistic walkers on the market. The walker is designed with a minimalistic approach and does not contain any inbuilt toys or electronics in it. I know it is a bit different design approach compared to most of the walkers on this list, but it somehow works with Joovy.Instead of the inbuilt toys, Joovy has decided to put a large flat tray on this walker. As a parent, you know that there are so many toys laying around that you actually don't need an extra toy for a walker! The space in front of the walker, however, is a desirable real-estate! The tray is large enough to hold snacks and a sippy-cup, and of course some additional toys. Rather than spending the money on cheap toys, Joovy has decided to invest it in the quality and comfort of the product, and it shows. The walker is well-built, and the seat is very comfortable. The wheels on this thing are large enough, and your baby will have no issues in moving it around whatsoever. The overall design is also great, and the walker looks just fantastic. On the downside, the white color can get dirty quickly, especially with any spillage of food from the tray. The Dream On Me Ragtop walker is a great walker that can double as a rocker as well. The Sports car themed Walker looks as adorable as it is functional. The best thing about this rocker is the fact that you can easily convert this thing into a rocker in no time. So, you are getting two products for the price of one with this walker. Isn't that great?The walker is made from a high-grade plastic material that is both hygienic as well as sturdy. It has a nice weight to it as well. It is not too heavy for the baby to move, but it is heavy enough not to get toppled over at the same time. The wheels of this Walker are big enough to allow for easy movement on even a thickly carpeted flooring. There are some toys on this walker as well that will keep your young one occupied and entertained. The front panel of the walker with all the toys is designed like a dashboard of a sports car and can be removed as well. It is available in multiple bright colors as well that adds to the overall appeal of the unit. All said this is a fantastic unit if you have a thickly carpeted floor. The electronic toys in the unit seem to have a very short battery life. It might not be an issue if you decide to have a rechargeable battery on hand, though. If you are still on the fence regarding the benefits of baby walkers, here are some of the ways baby walkers can help your child. Walkers allows the baby to become more independent and move around. These walkers are designed in such a way that the movement of the baby is unencumbered and free. They allow the baby to move around quite freely. The security and safety of a baby walker mean that your baby feels encouraged to explore the surroundings. The walker will allow your baby to be mobile and move around the house rather than being confined to his/her playpen. One of the prime functions of a baby walker is to provide support to the baby. As the muscles of babies are weak and developing, the walkers provide the much-needed extra support. Walkers can also help your baby to avoid developing poor posture as well. Walkers are designed with the safety of your baby in mind. The walkers prevent your baby from falling and hurting himself/herself in the process. They also protect the babies from sharp edges and corners. Most pediatricians recommend mild to moderate exercise for babies. Rather than having a baby sit in a crib or a bassinet all day long, you can use the walker to help your baby exercise and move around. As the baby moves around within the house, he/she is exposed to newer experiences, lights, sounds and the like. It can help in the overall development of the baby in a big way. Most baby walkers on the market contain an entertainment unit for your child. These units often include some engaging lights, sounds, and toys that will keep your young one occupied and entertained. Parents are cautious while purchasing any product for their babies, as they should be. Although all the baby walkers may look similar, they are certainly not. There are many features that a good baby walker must have. If you are not careful in checking out these features, you stand a risk of choosing a walker that is, simply put, not worth your time or money. Here are some important features that you should be looking for when you are deciding on a baby walker. The seat fabric and the foam padding are one of the most important features that impact the comfort of your baby. If the fabric is not soft, it can cause significant problems that may include rashes, allergies and chaffing. Some walkers have a plush and soft material on the seat while some others have a firmer fabric. While the plush fabric may make the seat quite comfortable, it is not without its disadvantages. That said, the plush fabric makes for a better experience for the baby. Some cheaper walkers on the market have such a thin and flimsy foam that they can be quite painful for the baby to use. Stay away from them at all cost. Another useful feature to have when it comes to the seat fabric of a baby walker is the removability. Some walkers allow you to detach the seat fabric and in some cases even the foam so that you can wash them and clean them. Walker seats get dirty, and the ability to take the fabric cover out and clean them makes a heck of a difference. Quality is the one thing that is paramount in any product that you buy for your baby. From the quality of the design to the choice of the material used in the construction, everything matters. Most of the walkers are made from a plastic material, and it is important to understand that not all plastics are made equal. I would advise you to look for plastic that is BPA and Phthalate-free as far as possible. Babies love to nibble at everything in front of them and trust me; your baby is going to nibble on any accessible part of that walker as well. It is always a very good idea to make sure that the plastic your baby might bite into is free of toxic chemicals. Another thing to note is the overall build quality. You don't want a walker that is flimsy and weak. It should not be easily toppled by the baby, and it does not hurt if it has some weight to it, not a lot, but just enough to be not toppled by the baby. Many baby walkers come with a feature where you can adjust the height of the walker. It is a great feature to have as babies grow quite rapidly during their first two years. As your baby grows in height, you can adjust the height of the walker so that he/she can keep on using the walker without a problem. Most walkers offer three levels of height adjustment, but some do not provide this feature at all. If you want your baby to use a walker for a longer time, stay away from such walkers at all cost. Portability is another top feature you should be looking for while purchasing a baby walker. Unless you have a lot of space in your home, you want a walker that is sturdy, yet easy to store. Many baby walkers offer quite innovative designs that allow you to fold them neatly so they occupy a small place and can be tucked away under your bed. While most walkers do fold up to allow easy storage, some don't. Obviously, such walkers are not ideal for small apartments or if you have space constraints. The most important function of a walker is to provide mobility to your baby, right? So, by that logic, the wheels are one of the most important parts of the whole unit, won't you say? But many parents just overlook this feature altogether. There are two kinds of setups when it comes to wheels on a baby walker. In the first configuration, the front two wheels are rotatable while the rear two wheels are fixed. In the other setup, all the four wheels are rotatable. Now, this may not seem to be much of a big deal, but hear me out. In the first setup, as the rear wheels are fixed, the baby can move only forwards and backward in straight lines. Also, the walker can be turned only at right angles. The second setup allows more maneuvering compared to the first one. As all the four wheels are rotatable, the baby can move the walker in any direction. Now, both these setups have their advantages and disadvantages; you should be aware of your limitations while making a decision. The wheels are one of the most important features to consider while buying a baby walker for a carpeted floor. If the wheels are too small, they probably won't work on a carpeted floor very well. Generally speaking, go for a walker with larger diameter wheels rather than the one with smaller wheels. In all likelihood, the bigger wheels will make the Walker carpet-friendly and easy to maneuver for the baby. Another important thing to consider is the surface of the wheels. If the wheels have ridges on their surface, they will offer more friction and grip. However, it can work against the walker if the resistance is too high as it can get harder to move it on a carpeted floor. So, as a rule of thumb, larger wheels with more grip are best for a carpeted floor, while smaller wheels can be okay for a hard floor. Again, safety and security is perhaps the most important thing to look for in anything that you buy for your baby. As the walkers help your baby get mobile, they need to be extra safe. There are many safety features in a baby walker such as harness systems to keep your baby safe and secure. However, one of the most important features is the anti-skid safety pads. These are so important that most baby walkers that are sold in the United States have these. They help prevent the walker from going over the edge of stairs and ledges. They are critical, and you should never buy a walker without them. The entertainment consoles are small electronic devices attached to the walkers so that your child can interact with them. Most of these consoles play a sound or nursery rhymes with flashing lights. Having such a console on a walker is a great idea. The baby is occupied and entertained at the same time. Now, what type of console do you prefer is a completely personal choice. Some consoles are removable so that you can clean them properly and your baby can play with them even when he/she is not using the walker. Most of these consoles have safety features and operate on batteries. Baby walkers have one of the widest price range of any baby products. The choice is quite huge. No matter what price range you have in mind, here are some facts that can help you make the decision. Walkers that are very inexpensive are perhaps not a very good idea. In out experience, they are made with cheap material and can have many problems. At the same time, you don't need to spend hundreds of dollars on a walker as well. There are many budget friendly walkers on the market that offer a great value for your money. So, there you have it, these are the things to look for while purchasing a baby walker. But there are so many of these walkers on the market that picking the right one can be time-consuming even when you are equipped with all this information. After carefully testing and reviewing the best baby walkers on the market the Combi All in One Baby Walker. It is a great walker that has the best features in each category. It is sleek looking and durable at the same time. It is very comfortable for the baby, and the entertainment system is awesome. The safety features on this walker are top-notch as well. The best baby walkers on the market for a carpeted floor, the Bright ﻿﻿﻿Starts ﻿﻿Walk﻿﻿-A-Bout Walker takes the top spot if only by a thin hair margin!It is a very well made walker that works great on a carpeted floor. I loved the design and the fact that is available in multiple colors/styles. 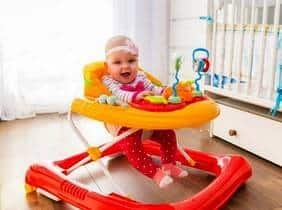 The entertainment unit on this walker is also of a high quality and can be removed so that the baby can play with it even when not using the walker. We hope that this article narrowed your search for the best baby walker. If you find the information in this article helpful, please share it with your friends and help every parent find the perfect baby walker for their little baby! Live Strong: What Age Can a Baby Use a Baby Walker?